With less than three months left before voters decide between President Barack Obama and his Republican opponent, Mitt Romney, Obama has a strong lead in the latest Politico poll figures. Politico identifies ten swing states that will most likely decide the 2012 election. Obama leads in nine of them: Colorado, Florida, Iowa, Michigan, Nevada, New Hampshire, Ohio, Virginia, and Wisconsin. Romney leads Obama by one percent in the swing state of North Carolina. If these swing vote states hold up in an election that requires 270 out of 538 electoral votes to win a majority, Obama would gain 111 electoral votes to Romney’s 15. States that appear solid or leaning for Obama give him an addiitional 221 electoral votes. Romney’s solid or leaning state electoral votes total 191. These figures add up to 332 for Obama and 206 for Romney, more than enough to give Obama the winning total. A major reason we might safely assume these numbers will hold up can be found in an ABC-Washington Post poll which found that only 40 percent of voters “hold a favorable view of Romney”. In a late May poll, that number was 41, suggesting a downward trend. Low favorability numbers this late in the campaign does not portend well for the challenger. Romney’s unfavorable rating increased from May to August by four percentage points, an increase from 45% to 49%. Say what you will about their actions in office (and I would have many unfavorable things to say about the damage they did), Ronald Reagan and George W. Bush were “liked” by a majority of the voting public, enough to help bring them to the White House. 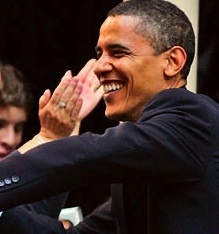 Michael Tomasky, writing for Newsweek’s The Daily Beast, predicts a possible Obama landslide in November. Tomansky points to a winning trend, beginning with Pennsylvania’s shift from a swing state to a strong or leaning Obama state. There’s a secret lurking behind everything you’re reading about the upcoming election, a secret that all political insiders know—or should—but few are talking about, most likely because it takes the drama out of the whole business. The secret is the electoral college, and the fact is that the more you look at it, the more you come to conclude that Mitt Romney has to draw an inside straight like you’ve never ever seen in a movie to win this thing. This is especially true now that it seems as if Pennsylvania isn’t really up for grabs. Romney’s paths to 270 are few. First, let’s discuss Pennsylvania. There has been good reason for Democrats to sweat this state. True, Obama won it handily in 2008, by 10 points. But it’s a state that is older and whiter and more working-class than most of America. Obama benefited from all the unique circumstances of 2008 that helped him across the country, but if ever there were a state where the “well, we gave the black guy a chance and he blew it” meme might catch on, it’s the Keystone State. In Pennsylvania the incumbent Obama benefits from a jobless rate of 7.5 percent, well bellow the national average. In addition, the Republican national strategy to suppress voting by minorities has run into a judicial roadblock in Pennsyvlania. This odious voter ID law is facing meaningful challenges. A hearing on the law’s validity has just been concluded. A state judge says he’ll rule on the law’s constitutionality the week of Aug. 13. It sounds as if the law’s opponents made a stronger case at the hearing than its supporters. In any case, the losing side will appeal to the state Supreme Court. The one thing that could seriously halt an Obama landslide would be interference by outside forces. That may well have been the case with the Iranian government in the Carter-Reagan election in 1980. Whether Republican campaigners made a secret deal with Iran to hold American hostages until after the election, is still hotly debated. But the fact that the hostage release was timed by Iran to fall on Reagan’s 1981 inauguration day offers strong circumstantial evidence that the Iranians did not want Carter to get any credit for negotiating the hostage release. A release of the hostages prior to the election would have greatly enhanced Carter’s chances of reelection. Gary Sick’s book, October Surprise, offers strong support to the belief that Reagan’s campaign staff interfered in delicate international matters for their own partisan political reasons. Is Israel’s Prime Minister Benjamin Netanyahu offering Mitt Romney another October surprise? His bellicose threats to attack Iran would impact the election, even as it set in motion a series of events destructive to the region. Why would he put the lives of his own citizens in such danger? One strong reason could be his belief that a Romney victory would return Israel to the glory days of George W. Bush. During his recent fund-raising speech in Jerusalem, Romney said Israel’s culture was “superior” to that of the Palestinians. Romney was so caught up in his culture pandering to his Israeli and American pro-Israel audience, that he completely ignored the impact of the occupation on the Palestinian economy. Netanyahu enjoyed eight years of his relationship to Republican President George W. Bush, who essentially gave Israel a green light to carry out its plan to take control of what Netanyahu calls Judea and Samaria, but which the international community correctly identifies as the Occupied Territories of the West Bank, Gaza, East Jerusalem and the Golan Heights. Israel and its supporters also know full well that the two-state solution is dead, and good riddance because it gave too much land and sovereignty to a collection of people whose national rights Israel has always denied. But it nevertheless plays a key role in perpetuating Israeli control of the Occupied Territory, holding everything in place until the Occupation is normalized, the Palestinians pacified, and the world moves on to the next urgent conflict. By playing along with variations of a two-state solution that it knows are unacceptable to the Palestinians—for example, a “two-state solution” in which the Palestinians are locked into a non-viable, semi-sovereign Bantustan—Israel is able to avoid any genuine solution to the conflict, since any genuine solution would require either too large a concession of land or shared sovereignty with the Palestinians. But while Israel endeavors (with the U.S., Europe and, for its own reasons, the Palestinian Authority) to keep the two-state charade going on indefinitely, it has already moved on to the next stage: putting in place an apartheid regime or—its preferable solution—simply warehousing the Palestinians forever. With US polls showing the strength of Obama’s lead three months before the election, would Netanyahu dare risk starting a war with Iran which he may think would guarantee a Romney victory? If that is the thinking in the Netanyahu war cabinet, it is wrong. Israel’s standing with the American public is not nearly as strong as the Congress, and Israel’s U.S. backers, think it is. Americans are tired of war and they do not like Romney. If Netanyahu attacks Iran over Obama’s objections, there is every reason to believe the American people would reject Israel’s action and stand behind their own president. As a second-term president, Obama would be in a strong position to start terminating Israel’s control of the American government. The picture of Obama is by Jim Mone of the Associated Press. It appeared in the New York Times. The picture of Halper is from Link. This entry was posted in Middle East, Middle East Politics, Netanyahu, Obama, Politics and Elections. Bookmark the permalink. Thanks for pointing to Obama’s good standing in 9 out of 10 swing states. An Obama win will give another opportunity for the US to enforce a 2-state solution, based on the 1967 borders. Otherwise, it will be a de-facto “one-state” reality that will lead to an inevitable Palestinian-majority state and the eventual emigration of many Israeli Jewish citizens to the US, Canada, and their original East-European countries. If, on the other hand, Israel chooses to attack Iran to force Obama’s hand, it may open Pandora’s box. How, after all, will the American people react to the gigantic rise in the price of oil, which would be an inevitable direct result of the invasion? How will American and European oil companies handle the disruptive decades of turmoil in the oil countries themselves? How will our country absorb a worsening job loss, due to the economic depression in the US and Europe? How will Israel cope with an angry US population, when the key economic and political turmoil will be directly atributable to Israel’s invasion? Our government, led by either party, always kowtows to the Israeli Lobby, because of the financial resources and one issue nature of the Lobby. So both parties support apartheid and occupation. However if Romney were elected, things would be far worse, as seen by his recent trip to Israel and his alliance with the billionaire, Israel Firster, Adelson and neocon Israel Firsters like Dan Senor, who leads Romney’s mideast advisors. I also think that if Romney wins, we will have a third mideast war, this time with Iran. The control of our mideast policy in congress by AIPAC and its friends, should be unacceptable to the American people. To put another nation.s interests ahead of our own is nothing short of treason.